Up until just a few years ago, people did not grasp the essence of dog car seat covers. Every time they took trips with their dogs, they simply placed their pets on top of towels or blankets. At the end of the trip, the towels and blankets were usually on the floor and your dog was still in the seat. Apart from that, towels and blankets failed to save dogs from the bumps on the road and generally did a poor job of keeping pets protected. Since the pet car seat covers became mainstream, dog owners have been snapping them up left, right and center. If you are still not on board with the idea, then you might need to be brought up to speed with the need for these accessories. 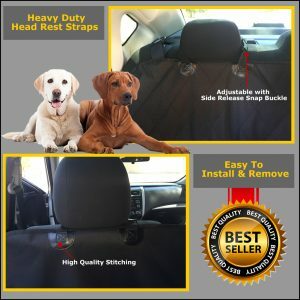 Dog car seat covers from Yippr.com are made of a soft quilted fabric that feels smooth on your pet. The roads out there will at times be bumpy, so you want a buffer to make sure that your pet does not come in the way of harm. Even if there is a lot of bouncing around or you are going through a rough patch of dirt roads, your dog will be insulated from the sort of irregular tire hops that lead to discomfort and muscle sprains. If you are driving out there and it’s cold, covers can be very handy because they keep the dog warm and happy. This is in fact the biggest reason why people go for these covers. You have probably spent thousands of dollars on your car, and you want to keep it neat and new for as long as you can. The thing about dogs is that they can get a little out of hand. They are known to scratch and paw at your interior upholstery, and those repairs will really hurt your wallet. Dog seat covers prevent pets from resorting to the damage of the sort caused by scratching. Apart from that, dogs are known to experience accidents from time to time. If your dog has any sort of accident on the car, then you can be sure the vehicle will be smelling for days on end. What you want to do is have the dog sit at a spot you can easily clean, and the best spot is on top of a seat cover. Most car seat covers for dogs are easy to remove and are machine washable; and the best part is that no dirt, food particles, or dust makes its way to the surface of your car. Dog fur has for a long time been known as a source of allergies and more. Now, kids are more susceptible to allergies than any other age group, so you want to keep them away from pet fur. The aforementioned dog car seat covers are known to trap fur, so it never finds a home in the interior of your car. Yippr car seat covers are premium products at a reasonable price. They come in grey and black and work for most regular sized vehicles. The pieces are easy to handle, wash, and put back in to the vehicles.